Starting this Thursday, August 23rd, new Destroyer-class vessels are being made available on the C-Store for Federation and Klingon characters, and their respected allied members among the Romulan and Dominion factions. These new vessels will be available in both Non-Fleet and Fleet variants. Special Introductory Pricing Discount! From now until Monday, August 27th you can get these ships for 20% off. Thereafter, they will return to their normal pricing at 3000 ZEN when purchased individually, or 4000 ZEN for the 2-ship Bundle. Fleet versions of each of these Destroyers will unlock upon completing your Fleet Starbase’s Tier 4 Shipyard. 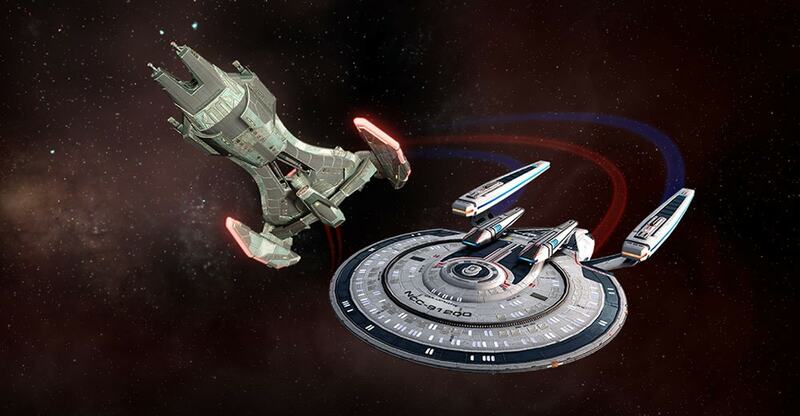 The standard Fleet Module discounts apply if you have purchased the ships from the C-Store. In these trying times, constant conflict and ever-present hostility have made exploration and reconnaissance at the edges of the frontier an even more dangerous endeavor than normal. The Recon Destroyer has been designed in response to this galactic atmosphere, providing a distinct combat focus to a ship that is otherwise dedicated to scientific study and intelligence gathering. The Lafayette-class is a modern re-design of the classic New Orleans-class, which first came into service with Starfleet in the mid-2300s. This starship features a Lieutenant Commander Universal/Intelligence Specialist Bridge Officer seat. The Fleet Recon Destroyer has been specifically designed to support your Fleet. Fleet Starships are built to the highest standard and have increased Hull Hit Points, Shield Strength and an additional Console slot. The Ketha Recon Raptor has been named after the home province of one of the Klingon Empire's modern heroes, General Martok. The Fleet Recon Raptor has been specifically designed to support your Fleet. Fleet Starships are built to the highest standard and have increased Hull Hit Points, Shield Strength and an additional Console slot. This technology was originally conceived as a hyper-accurate long-range scanning device, capable of dissecting quantum data from distances previously unheard of. However, once prototyping began, it quickly became evident that the trinary emitter-beams used to scan and receive such data caused irreparable damage to matter caught in the crossfire - an issue further confounded by the fact that without targeting parameters designed for precise weaponry, the system takes several seconds to focus on its intended target. While these compounded issues resulted in the scanner functionality of the device being abandoned, the easily-weaponized emitters found a new home in this starship defense project. This console also provides a passive boost to Shield Hardness and Shield Penetration skills. This console mod can be equipped on any starship, in any console slot. Only one of these consoles may be equipped on a ship at a time. While this trait is active, defeating enemies or healing allies will grant you one stack of Jubilant Cadence a maximum of once every 4 seconds, which last until you leave combat or are defeated. After reaching 5 stacks, you and your teammates will receive a large boost to speed and turn rate, while also having all bridge officer ability recharge timers reduced. ** DISCLAIMER: All stats, abilities, and other details are subject to change.